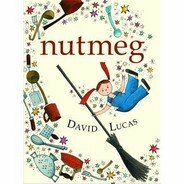 David Lucas Review: Nutmeg, a picture book for young children. David Lucas Review. Nutmeg is a young girl with red hair, who dresses in blue overalls, and begins the story in a state of melancholy. Nutmeg's mental state is perhaps understandable, for her circumstances are pretty bleak. She lives with her stodgy Uncle Nicodemus and young cousin Nesbit, who likes to fiddle with things. They live together in a ramshackle house in a gray, deserted environment that could be accurately described as a junkyard. It gets worst. Their diet consists of scraps of cardboard, pieces of string and loads of sawdust, which is lovingly prepared by feckless Uncle Nicodemus, every day. There was always cardboard for breakfast. There was always string for lunch. There was always sawdust for supper. And that pretty much describes their existence, until one day Nutmeg wanders near the river and discovers a blue bottle floating in the water there. In the bottle is a genie who grants Nutmeg three wishes. And, as you can imagine, the first item on Nutmeg's list of wants is something different to eat for breakfast, lunch and dinner. Nutmeg is a simple story that engages young readers and works well as a shared reading text. The illustrations are at times beautiful and help to convey the mood of the story. For instance, the colours at the beginning of the story are a wash of drab grays and browns, to reflect Nutmeg's dreary existence. Toward the end of the story, the colours are a magical and creamy palette of pastel greens, blues, pinks and yellows. The story also has some interesting, and a little out of the ordinary, words such as conjured, hoisted, and banister, which students enjoy looking up in a dictionary to find out what the words mean. Nutmeg is a simple tale with excellent and dramatic pictures, particularly the voluptuous banquets of food the genie's spoon prepares. The story arc is a most satisfying one. This book is recommended for younger readers between grades one to three.